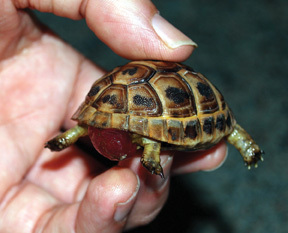 A two year old Libyan tortoise was discovered in the afternoon with a intestinal prolapse. 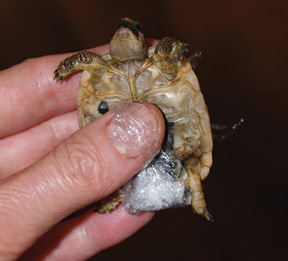 The prolapse was too large to be replaced, so to quickly reduce the swelling and prevent tissue damage, the prolapsed intentine was covered with table sugar and secured with plastic wrap taped to the top and bottom of the shell. The sugar, which quickly began to draw out the fluid, was replaced each time it became saturated.. By late evening, the swelling had gone down considerably. The tortoise was regularly checked during the night and in the morning was taken to our specialist veterinarian, Lance Jepson, to replace the prolapsed intestine and determine the cause. A x-ray confirmed that a bladder stone had formed, and the prolapse was the result of the tortoise straining to pass it. Unfortunately, the stone was slightly larger than the space between the pelvic bones, and could not be passed. 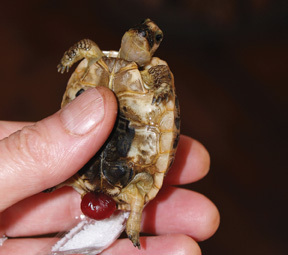 Surgery was a very risky option with such a small tortoise, so the decision was made to begin a daily dose of allopurinal, and to simply allow the tortoise to grow to a size where it could pass the stone. This tortoise always had access to water, which it drank regularly, but several daily baths were also given to ensure adequate hydration. 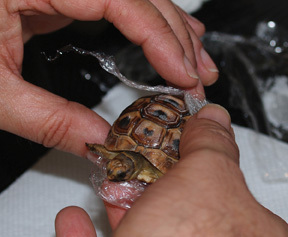 The prolapsed intestine was replaced and a purse string suture was put at the edge of the cloaca to prevent another prolapse from occurring if the tortoise was to strain to pass the stone again. It allowed enough space, however, for the passage of normal excretions. 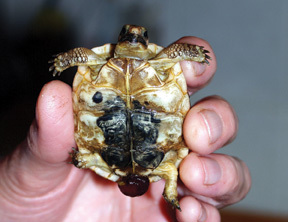 One month later, the bladder stone was found next to the tortoise which outside of a some minor swelling around the cloaca, was in perfect condition. The swelling went down by the next day, and the tortoise has been quite lively and with an increased appetite. We are continuing a daily dose of allopurinal until progress is reviewed by our vet, and we have continued daily baths to insure that the tortoise is drinking. The use of table sugar can be an effective method to reduce swelling of a prolapse as a prelude to surgical replacement. The method has previously been used in sheep and cattle, and even in human medicine. 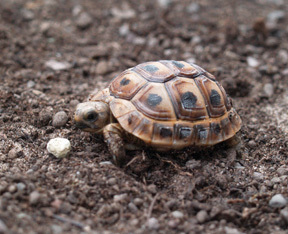 Sugar is an excellent growth medium for bacteria, however, so it is imperitive for the tortoise to receive antibiotic cover to prevent infection. 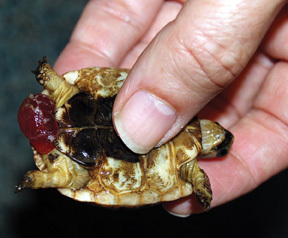 Any tortoise found with a prolapse should be brought to a specialist vet without delay. 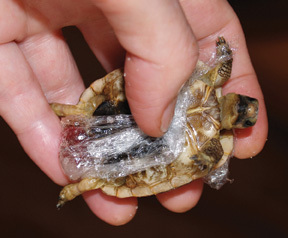 Do, however, protect the prolapse with plastic wrap to keep the area clean and prevent the tortoise from causing any tissue damage with its back claws. Bladder stones are often the result of dehydration, however, other metabolic conditions can also be underlying causes. A tortoise showing signs of straining or painful urination should be promptly taken to a specialist vet for diagnosis and treatment.